order for players to collect cards and win tickets ! SpongeBob Pineapple Arcade Token Pusher Game features collectible game cards around the playfield, which players try to knock off the tray to collect points. There are (9) SpongeBob Player Cards for players to collect, including SpongeBob SquarePants, Patrick Star, Squidward Tentacles, Mr. Krabs, Sandy Cheeks, Pearl Krabs, Larry the Lobster, Gary the Snail, and Plankton! Players can trade cards for tickets, or hold them until they collect all (9) cards for the Super Ticket Bonus ! 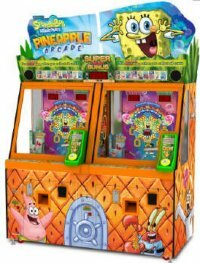 The SpongeBob Pineapple Arcade Game is one of the highest earning arcade games in the market today, and features characters from the world famous "SpongeBob SquarePants" franchise. The cabinet features colorful SpongeBob characters, plus a SpongeBob Marquee, LED Lights, Bonus Wheel, Targets and Card Dispenser. This great coin pusher is fun for all ages, and collectible cards keep players coming back again and again ! 68.9" x 35.7" x 98.8"